Simón Bolívar, the famous liberator of much of South America once said "If to Caracas I owe my life, then to Mompós I owe my glory”. 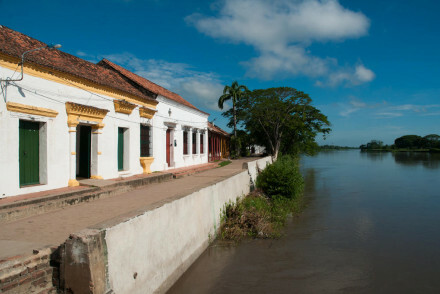 This small town, on an island in the Magdalena River, had almost all of its able bodied men recruited by Bolívar for the successful battle in Caracas. Once a thriving town built by the slave and tobacco trade, it is now one of Colombia's most perfectly preserved colonial towns. In steep decline since the 19th century due to the silting of the river, it has risen from obscure legend into fame: now a UNESCO World Heritage Site, full of boutique hotels, restaurants and a burgeoning tourist industry. Many of the best places to stay in Mompós are converted historical buildings which give a real feel of the town's past. A hidden gem, it is no wonder the town was relatively unknown until recently: it takes six hours to get here from the coastal city of Cartagena. Mule-driven carts outnumber cars and old rickshaws are used as taxis. Down the cobbled streets you'll encounter 500-year-old buildings in the form of multicoloured churches, decaying facades and palatial riverside mansions. Street vendors selling fresh fish and lemonade holler into crowds and down by the river, you can see leatherskinned men in straw hats unloading bananas from their canoes. The riverside restaurants are wonderful and for dinner, locals congregate in the main square and eat from the street vendors. A vibrant place, (the locals love to party) the riverside bars are full of friendly and fun citizens eager to meet the clutches of tourists who dare make the long journey to their beautiful town. Read up on your history before visiting La Piedra de Bolivar. This modest monument is a powerful indication of Bolivar’s influence on the town. Santa Barbara Church is small and beautiful, great to visit in the twilight when the lights come on. A mark of Spanish colonisation, Plaza de Mercado is the historic market building that sits amidst a host of small bars and restaurants. For dinner go to the main square and eat with locals from the street vendors, then head to the riverside bars. Mompós is picturesque and perfectly preserved, a true rarity. Make no mistake, it is a trek getting here, but it will be worth every bump on the unpaved roads. Our collection of the best places to stay in Mompós are ideally located to make the most of this picturesque spot. Portal de la Marquesa is situated beside the beautiful Brazo de Mompos river and was once a prestigious colonial house. Stunningly renovated, it now features traditional architecture and light, airy rooms. It’s also only a short walk to the town centre. Our partner Booking.com has a wide range of apartments and villas. The temperature rarely drops below 30 degrees, but to avoid the inevitable tropical monsoons it is best to go between December and March. Fly to Cartagena (Rafael Nunez International Airport) and then take the 6 hour Toto Express to Mompós. Explore all our options in Cartagena. Expand your search to include all our Colombia recommendations. A large and airy colonial house turned boutique hotel. Beautifully renovated throughout highlighting the buildings original features; think beamed ceilings, intricately carved doors and arched doorways. Boasting views over the river and just steps from the historic centre. Highly recommended. Local exploring - An atmospheric colonial house reminiscent of days gone by close to the historical centre of town. Birdwatching - The town's surrounds are an enormous area of low wetlands making this an ideal jump off point for birdwatching trips. Sights nearby - Numerous churches to explore the most noteworthy being the Santa Barbara, the San Francisco and the San Agustin.